I never thought this would actually work. But it does. There are two floors in between the basement and our “penthouse” flat and the wireless signal would often fail to work, even though the data rate was quite good on the repeater. I think there is a microwave somewhere near our repeater and the base station in the neighbouring house which just jams the signal quality. 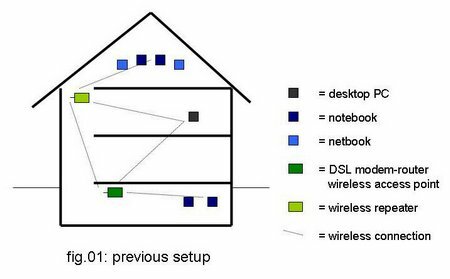 Both the DSL modem-router-wlan-ap and the repeater upstairs had been tuned with 4dB antennas. Wireless networks unfortunately tend to have the nasty habbit of interfering each other, especially if there isn’t enough “space” on the frequency range. And then, also, most of these conventional (= IEEE 802.11) wireless networks are still to fragile to deliver consistent data rates. By the time I set this network up in late 2007, most of our neighbours still didn’t have their own WLANetwork, but today most of them have do so it was about time for a change. 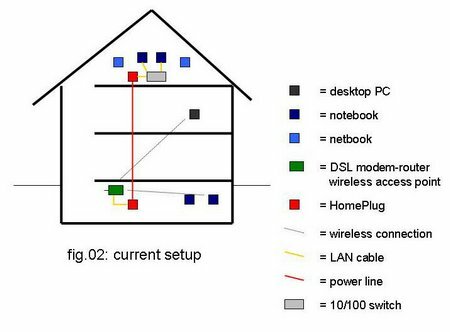 I had read about these “HomePlugs” – the “industry trade group for power line communication” which is a technology that connects LAN devices to each other through the power lines in a home. The manufacturers of these devices claim that it will only work on the same (electrical) phase, and since this house also has an electrical heating system and a second fuse box under the roof (next to the one in the basement), I initially thought it wouldn’t work. But it does! Fig.02 shows the current setup using two HomePlugs I’ve bought earlier this week. There are different manufacturers selling kits with two such plugs – mine was relatively cheap – an “MSI ePower 85 Kit Version II“. MSI claims this device to deliver up to 85 Mbps in optimal conditions but the actual rate is around 30 Mbps which is perfectly fine with me as our DSLine currently is around 8Mbps only. It’s also said to have 56bit DES encryption and you can also give it its own network name. The best part is the installation: Just open the box, take a plug and connect a LAN cable to it and the other end of the cable into your LAN device (here: the DSL modem router) and plug it into the next socket (I’ve even used an extension cable which shouldn’t be done but it still works). I then plugged in the other plug to a wall socket upstairs and connected it to an 8-port 10/100 switch which distributes the signal to all four computers as well as a VoIP phone and an HP OfficeJet 7210 network printer. This MSI ePower Kit comes with utility software to set extra parameters such as a network name or the password (which unfortunately only runs on Windows systems), but you won’t have to adjust anything. Just plug it in and you’re done! I was a bit sceptical if this would work out due to the additional power network in this house + possible intereferences that would spoil the reception of shortware radio (many radio hams actually hate this technology), but it just works like a charm and even my radioscanner hasn’t complained yet. For anyone who’s been having problems with a wireless network – if the voltage is more or less stable (= probably not in Kenya? ), I’d recommend these HomePlug/powerline devices as the perfect alternative to having (longer) LAN cables from one room to the other or even an unstable wireless connection.